The Office of Greenways and Trails updates the opportunity land and water trail maps every three years. These maps serve as the vision for the complete network of planned and existing trails in the state. After a lengthy public input phase and six public workshops around the state, the updated opportunity maps were approved by the Florida Greenways and Trails Council on Dec. 15. They can be viewed on the OGT website. Two new paddling trails were designated in the fall: The Buster Island Loop Trail at Lake Kissimmee State Park and the Choctawhatchee River Blueway in the Florida Panhandle. These are the 53rd and 54th designated paddling trails as part of Florida's Greenways and Trails System and they will be featured on the OGT designated paddling trails webpage. The 11-mile Buster Island Loop Trail begins and ends by the marina at Lake Kissimmee State Park. The trail is a loop. However, the endpoints of the trail are a short distance apart due to a water structure. The trail is suitable for intermediate paddlers due to the distance, tight turns on Rosalie Creek and potential winds encountered on the large lakes. The diverse habitat, a part of the Everglades headwaters, offers excellent fishing and wildlife viewing opportunities for the quiet and observant paddler. To celebrate the designation, local and state officials gathered on Nov. 14 to visit the park’s Cow Camp, canoe or kayak the Zipperer Canal with a park ranger and enjoy a picnic at the park with entertainment provided by local musicians. 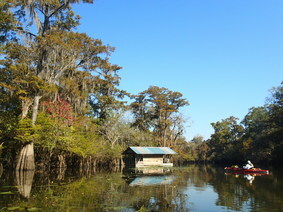 An excursion down the Choctawhatchee River Blueway is a journey into the heart of wild Florida where wildlife far outnumbers humans. Paddlers who are seeking an immersion in wilderness will be delighted by the mostly undeveloped landscape. The designated portion of this river is a 64-mile stretch between State Road 2 near the Alabama border to Cowford Landing on State Road 20. Beginning in Alabama, the river is 170 miles long with about 88 miles in Florida. The Choctawhatchee floodplain provides habitat for an array of native wildlife, with several endangered plant and animal species, including the federally threatened Gulf Sturgeon. There have even been rumors of the believed-to-be-extinct ivory-billed woodpecker hidden among the primordial wetlands. The Choctawhatchee winds through a broad floodplain dotted with old growth hardwood forests and a few sparkling springs whose clear waters mingle with the tea-colored flow of the majestic river. Paddlers must check weather forecasts and water levels carefully before beginning a Choctawhatchee adventure. The river’s flow will fluctuate with seasonal rainfall, and sudden rises may result from heavy rains. Paddlers must be comfortable with primitive camping with options limited the first 25 miles or so to exposed sand bars that may not be available if water levels are high. It is possible to paddle the river to its mouth at the Choctawhatchee Bay. However, this section can become confusing to navigate and detailed maps or hiring a guide is recommended. Arthur R. Marshall Loxahatchee National Wildlife Refuge located in northern Palm Beach County has opened 32 miles of new recreational trails. Five miles of trails in the upper A impoundments will be open for biking, hiking and fishing. The L-40 Levee will also be open for biking and hiking north of Lee Road for 12 miles. In addition, at the Hillsboro Area entrance, the L-39 Levee will be open heading west to the S-6 pump station, approximately 15 miles, connecting to the L-6 Levee in Water Conservation Area 2. Trail information can be found on the refuge website. The Shared-Use Nonmotorized (SUN) Trail Network, managed by the Florida Department of Transportation, now has a website. FDOT is currently receiving $25 million a year to construct paved non-motorized trails in the state. The network is a component of the Florida Greenways and Trails System coordinated by OGT, who is working closely with FDOT to develop regional trail criteria and priority regional trail projects. Robin Birdsong, formerly of OGT, is the new SUN Trail Network coordinator for FDOT. Gerri is from New York City and had lived in Tallahassee 10 years without seeing the beach. 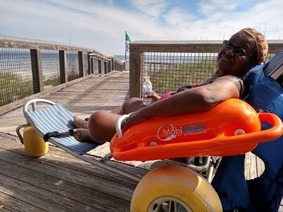 She was overjoyed in September to be invited by friends to travel to Dr. Julian G. Bruce St. George Island State Park to try out a floating beach wheelchair. Gerri cried when she saw the sparkling Gulf waters from the pavilion where she picnicked with friends and again when she began floating in the water, safely embraced by the comfortable chair. It was a magical day! The park staff were extremely accommodating and helpful and made a memorable ‘girls trip’ to the beach, one where everyone felt included. Most state parks located around Florida’s coastline offer a type of beach wheelchair. Several parks also offer all-terrain power wheelchairs for use on park land trails. Contact each specific state park to request an accommodation or submit an accommodation request online. 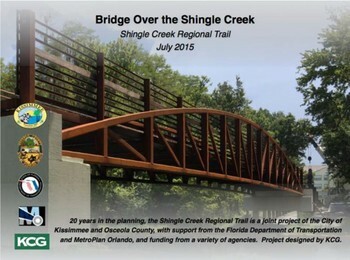 Twenty years in the planning, the Shingle Creek Regional Trail is a multi-use recreational trail being developed by the City of Kissimmee, Osceola County, the City of Orlando and Orange County. When fully constructed, it will span 32 miles through one of Florida’s most traveled urban areas. 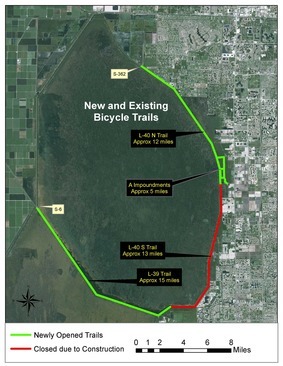 This trail will become part of an extensive trail network that stretches from the newly developed City of Kissimmee Lakefront Park to Wekiwa Springs State Park. In its entirety, it will serve as a key north-south connector in a larger regional trails network that includes the popular West Orange Trail, South Lake Trail, Cross Seminole Trail and the Seminole Wekiva Trail. In Osceola County, the latest accomplishment is completion of a 12-foot wide and 120-feet long pedestrian bridge over Shingle Creek. Trails and boardwalks leading to the bridge are currently under construction, but eventually will lead to a City of Kissimmee park, the Pioneer Village. The Pioneer Village features historic homes, barn, chickee huts and exhibits. Other trails connect to the Shingle Creek Regional Trail, including the 7-mile Kissimmee Trail Loop, a connected set of off-street paths, sidewalks and bike lanes that is three quarters complete. 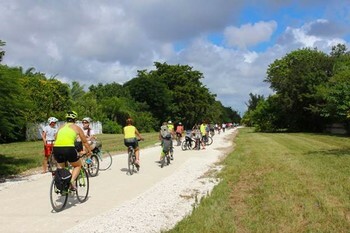 More than 300 people participated in the first official public ride down the Ludlam Trail in Miami on November 4th as part of Fall Fest, a kick-off event to move the dream of the Ludlam Trail forward. The festival was organized by Friends of the Ludlam Trail and Florida East Coast Industries. The ride was not a race, but a slow leisurely ride that allows each rider the time to soak in and appreciate the opportunity to one day utilize this trail every day. The proposed Ludlam Trail is currently a railroad right-of-way. This would be a recreation trail that cuts through the heart of Greater Miami. It is part of a grand vision for a system of trails throughout Miami-Dade County. This winter there are two sets of paddlers tackling the Florida Circumnavigational Saltwater Paddling Trail, a 1,515-mile coastal paddling adventure around Florida’s coastline. This journey typically takes 3-4 months to complete and exerts great demands from the few hard-core paddlers who complete the entire trip each year. Both pairs this year are paddling on behalf of non-profit organizations and raising funds for worthwhile causes. Steve Richter and Breanna Cruz began the Florida Coastal Challenge in October to raise awareness and funds for Heroes on the Water, an organization that offers kayak fishing as therapy for wounded veterans to help “calm the storm inside.” Steve and Breana are covering the coastline by stand-up paddle board, kayak, skateboard, beach cruiser biking, swimming, hiking, kite boarding and possibly other means. Jake Parker and Nicho Rivera call themselves the "Blackfoot Expedition," a name they developed while working together at a boys’ summer camp program. They have been long-time friends who share a strong sense of adventure and a desire to support the Florida Chapter of the Surfrider Foundation by completing the entire circumnavigational trail. They are leaving from the trail’s beginning point at Big Lagoon State Park near Pensacola in early January. The Office of Greenways and Trails has completed a report on Florida bike touring and bike camping opportunities along the State Trails. It can be downloaded from the OGT website. The Tallahassee-St. Marks Historic Railroad State Trail was featured in the winter edition of the Rails to Trails magazine, published by the Rails to Trails Conservancy. The article was written by OGT's Doug Alderson. Coordinators of the Statewide Comprehensive Outdoor Recreation Plan are holding two more statewide workshops featuring sessions by recreation providers and outdoor professionals: Jan. 19 at Gulf Coast State College in Panama City, and March 3 at Sunrise Civic Center in Sunrise. The events are free, but participants must register online..
Be sure to check out the OGT online calendar for trail events and workshops. The Rails to Trails Conservancy launched a new grant program in 2015 to support organizations and local governments that are implementing projects to build and improve rail-trails. Under the Doppelt Family Trail Development Fund, RTC will award a total of $85,000 per year for the next five years to qualifying projects through a competitive process. Applications for 2016 will be accepted through Jan. 31, 2016.